Propelled by the biggest percentage of sales to first-time buyers in almost four years, sales of existing homes in June kept an upward arc, growing for the fourth month in a row, according to the National Association of Realtors® (NAR). Total existing-home sales in June (counting transactions for single-family homes, townhomes, condominiums and co-ops) grew 1.1 percent to a seasonally adjusted annual rate of 5.57 million from a downwardly revised 5.51 million in May. After this gain, sales are now 3.0 percent higher over June 2015 (5.41 million) and represent their highest annual pace since February 2007 (5.79 million). NAR's chief economist, Lawrence Yun, said that the four month streak of sales gains through June showcased a solid first half of 2016. Yun noted, "Existing sales rose again last month as more traditional buyers and fewer investors were able to close on a home despite many competitive areas with unrelenting supply and demand imbalances." Yun added that, "Sustained job growth as well as this year's descent in mortgage rates is undoubtedly driving the appetite for home purchases." 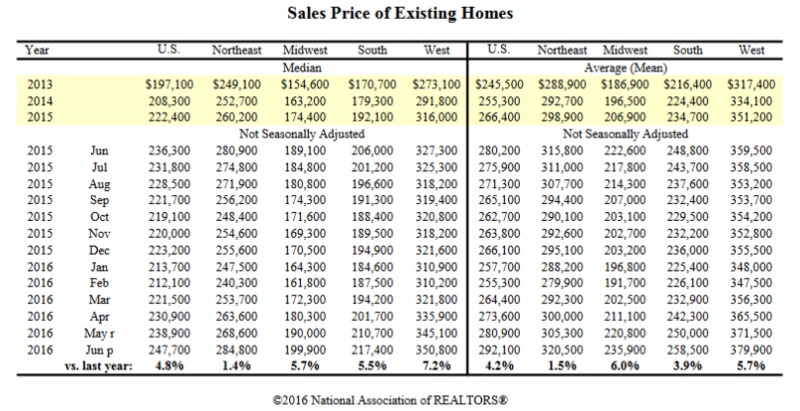 NAR's economist added a cautionary note: "Looking ahead, it's unclear if this current sales pace can further accelerate as record high stock prices, near-record low mortgage rates and solid job gains face off against a dearth of homes available for sale and lofty home prices that keep advancing." June's median price for existing homes (non-new builds) for all housing types was $247,700, up 4.8 percent over June 2015 ($236,300). June's increase represents a 52nd straight month of year-over-year gains. Total housing inventory by the end of June fell slightly 0.9 percent, to 2.12 million existing homes available for sale. Unsold inventory now sits at a 4.6-month supply at the current sales velocity. First-time buyers generated 33 percent of transactions in June, 3 percent higher than seen in May and a year ago -- in fact this is the highest since July 2012 (34 percent). Freddie Mac data shows the average commitment rate for a 30-year, conventional, fixed-rate mortgage fell from 3.60 percent in May to 3.57 percent in June. Mortgage rates have now dropped for four consecutive months, and June's rates were the lowest since May 2013 (3.54 percent). The average commitment rate for all of 2015 was 3.85 percent.